Fashion forward as well as flattering fit and pocket design make these a great value! Made in our most stretchy easy-to-wear Euroweave woven fabric with Syn-Tec Stretch Suede seat. DX models are enhanced with Dry-Tex to keep you dry and comfortable. Features the Dry-Tex Tec-1® comfort bottom to help you stay cool & dry under your tall boots, two stylized side pockets, and belt loops. 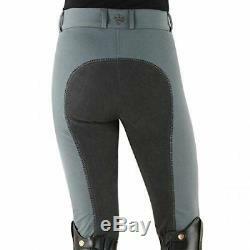 Ovation Ladies Celebrity Euroweave DX Front Zip Full Seat Riding Breeches. Horseware Ireland Heritage Gilet Vest Water Repellent with Fleece Lining. Shires Equestrian Elastic Riding Jodhpur Clips Black Pack of Twelve. Tough-1 Spandex Horse Riding Helmet Cover-Ups in Prints Wild Safari. Classic Equine Performance Reining Skid Boots with Hard Plastic Ankle Bulb. Be the first to receive exclusive. Listing and template services provided by inkFrog. The item "Ovation Ladies Celebrity Euroweave DX Front Zip Full Seat Riding Breeches" is in sale since Wednesday, July 18, 2018. This item is in the category "Sporting Goods\Outdoor Sports\Equestrian\Clothing & Accessories\Women's Clothing\Jodhpurs & Breeches". The seller is "onestopequineshop" and is located in Beloit, WI. This item can be shipped to United States, Canada, United Kingdom, China, Mexico, Germany, Japan, Brazil, France, Australia, Denmark, Romania, Slovakia, Bulgaria, Czech republic, Finland, Hungary, Latvia, Lithuania, Malta, Estonia, Greece, Portugal, Cyprus, Slovenia, Sweden, South Korea, Indonesia, Taiwan, South africa, Thailand, Belgium, Hong Kong, Ireland, Netherlands, Poland, Spain, Italy, Austria, Bahamas, Israel, New Zealand, Philippines, Singapore, Switzerland, Norway, Saudi arabia, Ukraine, United arab emirates, Qatar, Kuwait, Bahrain, Croatia, Malaysia, Chile, Colombia, Costa rica, Dominican republic, Panama, Trinidad and tobago, Guatemala, El salvador, Honduras, Jamaica, Antigua and barbuda, Aruba, Belize, Dominica, Grenada, Saint kitts and nevis, Saint lucia, Montserrat, Turks and caicos islands, Barbados, Bangladesh, Bermuda, Brunei darussalam, Bolivia, Ecuador, Egypt, French guiana, Guernsey, Gibraltar, Guadeloupe, Iceland, Jersey, Jordan, Cambodia, Cayman islands, Liechtenstein, Sri lanka, Luxembourg, Monaco, Macao, Martinique, Maldives, Nicaragua, Oman, Peru, Pakistan, Paraguay, Reunion, Viet nam.